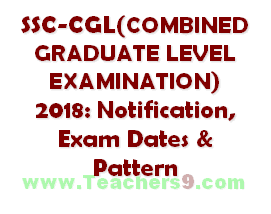 SSC CGL(COMBINED GRADUATE LEVEL EXAMINATION) 2018: Notification, Exam Dates, previous papers & Pattern.Staff Selection Commission will hold the Combined Graduate Level Examination, 2018 for filling up Group “B”and Group “C” posts in various Ministries/ Departments/ Organizations in the Government of India. The Tier-I of CGL Examination in Computer Based Mode is scheduled to be held from 25.07.2018 to 20.08.2018. Final selection through the Combined Graduate Level Examination, 2018 to various posts would be according to the confirmed number of vacancies from the concerned Indenting Ministries/ Departments/Offices/Cadres before declaration of result. SSC has published the revised schedule of all the exams to be conducted by SSC during 2018-2019. According to the SSC CGL 2018 Notification, the Combined Graduate Level Examination – 2018 Tier-I (CBE) will be conducted from 25th July to 20th Aug 2018(CBE).